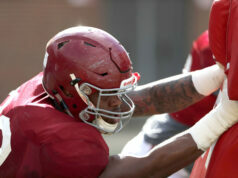 TUSCALOOSA, Ala. – The Alabama football team concluded its spring season with the annual Golden Flake A-Day Game Saturday afternoon in Bryant-Denny Stadium. 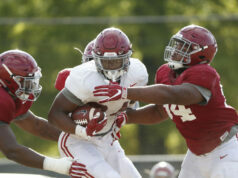 The White team came out on top of Crimson, 31-17. Freshman wide receiver John Metchie won the Dixie Howell Memorial Award (MVP of the A-Day Game), while senior linebacker Anfernee Jennings earned the Dwight Stephenson Award (Most Valuable Lineman of the A-Day Game). On offense, sophomore quarterback Mac Jones threw for 271 yard after going 19 of 23 with one interception and two touchdowns, while junior quarterback Tua Tagovailoa went 19 of 37 with one touchdown, one interception and 265 yards. Metchie led all receivers with 133 yards on five catches, while junior running back Brian Robinson, Jr., led all rushers with 42 yards on 11 carries, while adding 52 yards on six catches. On defense, freshman linebacker Shane Lee led the way with seven tackles, including six solo stops and an interception. 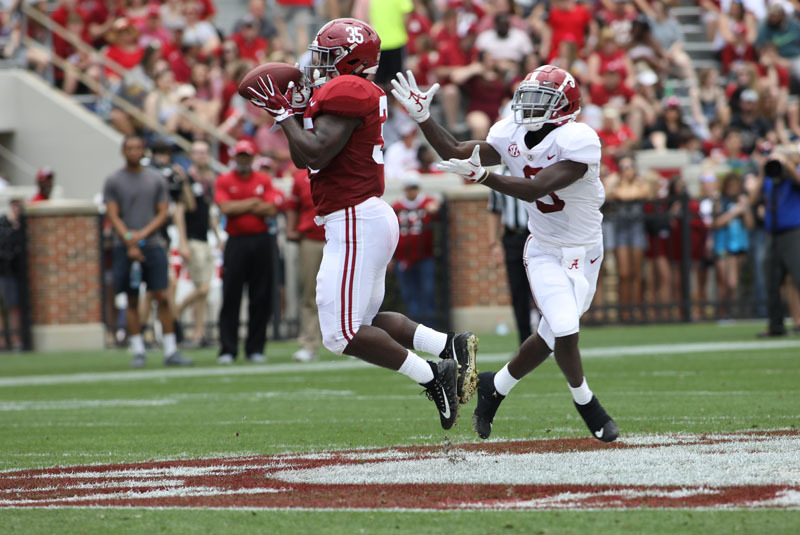 Following an 18-yard interception return by Lee, the Crimson side got on the scoreboard first with a five play, 30-yard drive, capped off by junior running back Najee Harris reaching the end zone from four yards out. Redshirt sophomore kicker Joseph Bulovas converted the extra point to make it 7-0 with 3:42 left on the first quarter clock. On the ensuing drive, the White squad marched down the field when Jones found Metchie deep down the middle for a 49-yard strike. Four plays later freshman kicker Will Reichard knocked through a 43-yard field good attempt to make it 7-3 with 1:10 on the clock. Crimson answered back with a field goal of its own after driving 59 yards in eight plays with Bulovas converting the 34-yard attempt to push the lead to 10-3 with 11:42 remaining before the half. White tied the game up at 10-10 with 1:23 to go before the halftime break when Jones found junior tight end Kedrick James for a 29-yard touchdown. Reichard’s extra point finished the six play 69-yard drive. 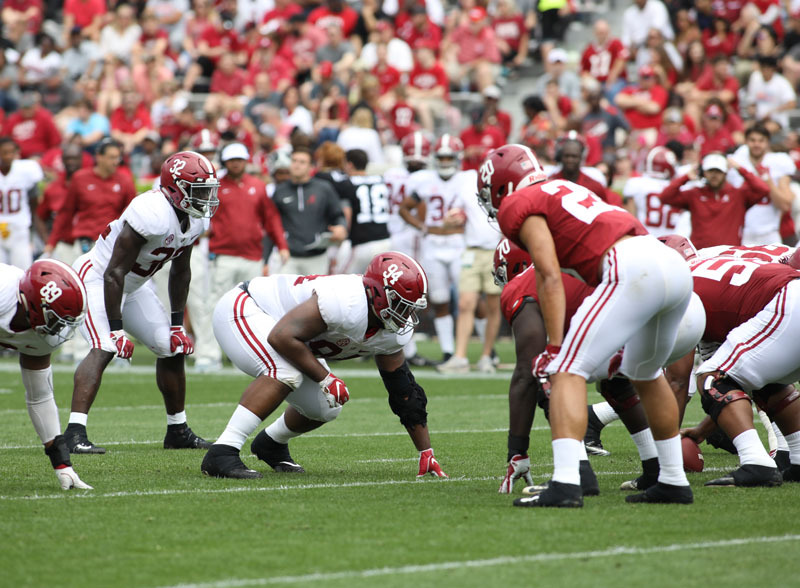 After a quick Crimson three-and-out, White got the ball back with 47 seconds on the clock. 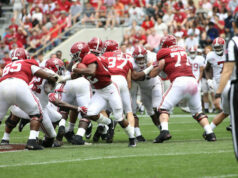 Jones led the squad down the field and connected with redshirt freshman Xavier Williams for a 22-yard touchdown pitch-and-catch. The Reichard extra point made it 17-10 going into halftime. 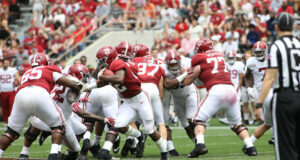 In the third quarter, White extended its lead when freshman quarterback Taulia Tagovailoa linked up with sophomore wide receiver Jaylen Waddle for a 29-yard touchdown with 5:16 on the clock. Reichard’s point after made it 24-10 to cap the seven play 77-yard scoring drive. On the next Crimson drive, sophomore linebacker Jaylen Moody snagged the attempted pass out of the air for an interception and took it 30 yards for the score. Another extra point from Reichard had the White team in control, 31-10 with 3:31 left in the third. The Crimson team scored on a 54-yard Tua Tagovailoa to junior wide receiver Jerry Jeudy late in the fourth quarter. Bulovas’ extra point made it 31-17 with 2:10 left in the game.